Fear of spiders, a ring and a sinister stranger ... how bad can things get? I don't know how it got here and it's not my fault, the nasty hard, harsh, glaring thing--round, cold and not delicious at all. I almost broke a stinger on it. I didn't take it. I don't deserve for the monster to come for me, but it's coming, it's coming, so ugly, so pale, with curling tendrils on its head the same color as this inedible ring, and only four appendages rather than eight glorious ones like mine. It lumbers toward me, dressed in pale polka dots and lace and carrying a small version of itself. Now its shadow falls across my web. I'm sorry I stole your ring. Wanna see more great stories? Click here. 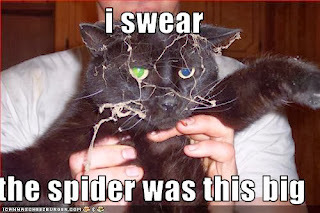 I ain't no afraid of little spiders but that big? I would say YES what if they bite me? I'll be okay? 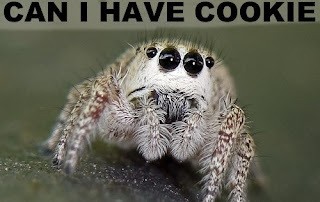 that would means NO because other spiders have poison so it's impossible to survive if they bite you.